There’s been a ton written recently about Heather Ross and her imminent hiatus from the fabric design world–read all about it here. Her last collection, Far Far Away for Kokka, is due out any minute now. I’ve just received swatches from the US distributor, and I gotta say, folks: WOW. This stuff is all kinds of great. When word got out about the non-compete agreement and it became clear that Heather would need to take a break from fabric design, Kokka opted to pull the cotton sheeting printing of these fabrics and is producing them only in double-gauze. It is TO DIE FOR, for reals. I’ve already placed an order, and am giddy with anticipation for its arrival in the shop, and I’ve come up with a brilliant GIVEAWAY IDEA: I’m inviting Whipstitch readers to offer yummy giveaway ideas in the comments section–if I choose your suggestion, YOU’LL get one of the prizes in addition to the giveaway winner! Consider it a little compensation for sharing your intellectual powers with Whipstitch. Look for the giveaway and the fabric sometime this summer. Just came over @ the recommendation of True-Up… and holy moly, love your blog and have added to Google Reader! That table runner with Good Folks is to die for! And a suggestion for a use of the HR fabric – AB’s Birdie Sling, of course! An awesome giveaway would be a fat quarter, or even a *gasp* half yard set of the fabrics along with a copy of her new “Weekend Sewing” book! Fat quarter pack?? Oh the pretty pretty girly things that could be made with that! My suggestion would be two yards of one of the fabrics — a lot, I know! — but that would be enough to make the Summer Blouse from Weekend Sewing, and double gauze would be perfect for the blouse pattern. A copy of Heather’s book and enough fabric to make one of the projects. Maybe a fat quarter pack or something. I have to agree with the fat quarter pack, but along with it you should include some sort of quilt/sewing challenge. The winner could complete her interpretation of your challenge, and then you could blog about it. How about a good old fashioned game? Since the fabric has the Princess and the Pea drawings, why not put dried peas or beans in some kind of container and let us guess how many are in it to win the coveted fabric? Heather's fabric reminds me so much of my early days and college days…the beach, banana seat bicycles, VW campers, the outdoors as well as my dad reading fairy tales(including Princess & the Pea) to us from his childhood books! I can't wait to get my hands on these prints!!! My post above was supposed to suggest a fat quarter set or a half yard set plus the book… upon reading it, I realize it was unclear. Well, it’s already been said, but the best giveaway would definitely be fabric from this new line! I’ve been waiting for this fabric to come out so I could make another summer blouse, so I was going to say enough fabric to make the blouse, but I see I’m not the first with that idea! How about enough fabric to complete an entire weekend wardrobe? Is that asking too much?! A fat quarter pack would be wonderful – anything Heather Ross + Kokka would be sooo lovely! So here’s the idea: Each participant must speak of a “far far away” adventure. It may be imaginary or a past experience. The winner of the giveaway can then show the readers what she does with the fabric. The result should be inspired by her story/adventure! I think an old-fashioned snail or frog race is in order! My siblings and I held MANY of these grand events during the summers when we were kids. I fondly remember gently lining up the athletes, and whispering words of encouragement in their ears (do snails have ears? ), then letting go on the count of 3 (or maybe a *teeny* bit before). Then the giggles and excitment while we waited for the results to come in. So fun! From the blog readers that pick the right racer, you could use the random number generator to pick a winner. For a prize, that is tough. I was really excited to make a quilt out of the sheeting. But double gauze seems more suited to clothing, which takes some serious yardage. Maybe enough yardage of the snail print and frog/lily pond print (in the winner’s choice of colorways to make a garmet each? Can’t wait for the line to come out! some yardage–enough to make a garment. What I have seen of this fabric is to die for! I suggest that everyone who wants to be in with a chance for the give-away should have to say what fairytale and/or fairy tale character they would love to see on fabric and to give a reason such as what they would want to make with it. 2 half yard bundle with a copy of her book. My idea was to have entrants leave a comment about their favorite fairytale character–just for fun. I love reading through comments to get ideas for new things to read. Any amount of fabric from the new line would be a wonderful giveaway. I sew garments and plan to buy some yardage for that, but I also love fat quarters and even charm packs. I think double gauze is wonderful for quilts, too, and I have a doll quilt in mind. Thanks for the fun contest! OK, I’m thinking you wanted an idea for what REASON you would use to give away fabric, right? Not WHAT to give away? 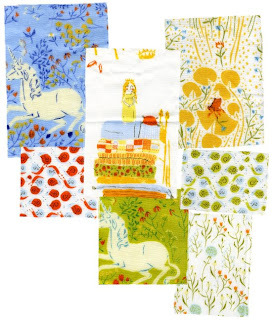 The contest should be to create a new fairy tale character inspired by one of these fabrics. The prize could be a yard of the fabric used for inspiration, and a fat quarter each of the remaining fabrics. Great idea for a contest! I think that a signed copy of Heather’s new book would be wonderful, to top it off a bit of her new fabric to play with while looking through her new projects. Lots of good ideas, my idea is some solids and some prints, 2.5″ strips or charms or something big enough to incorporate into something useable, quilt, table runner, wallhanging, etc. What an awesome giveaway and the line looks like it will be great FUN to play with. These are all SO GREAT. I love hearing what folks would like to win and what you’d do with it if you did. Sewing Geek is right on the money, though: I’m looking for an idea of how to structure the giveaway and what challenge to place before the “contestants.” I see a bunch of good ideas here, but we’ve got a few weeks left–I’d love to hear more! Keep those ideas coming! After staring at the fabric for way longer than I intended, it is beautiful, my idea would be to make people write about their favorite fairy tale and maybe which fabric they think reminds them of the fairy tale most. Most would be pretty obvious, but some answers might be really neat! Love this fabric! Ask for your readers to create a little story about the fabric that’s different from the original Princess and the Pea. Then give away some fat qtr packs of the fabric.